Have you ever dreamed about a truly lightweight but yet functional and user-friendly e-Commerce platform? 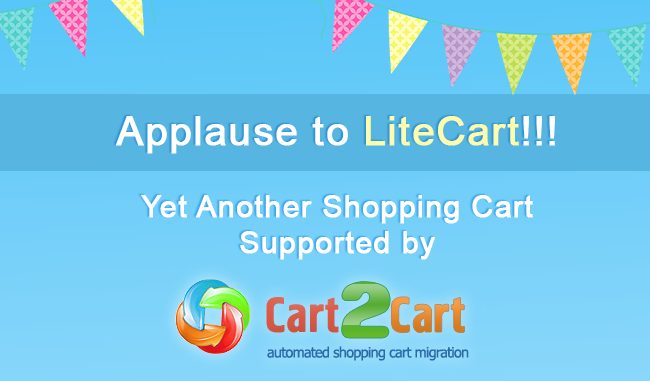 Now you have a chance to obtain one - LiteCart has been added to the broad list of shopping carts supported by Cart2Cart! From now on, you can perform an easy switch to this innovative solution moving all your current e-store data in terms of several hours! LiteCart is a free, open source shopping cart built with PHP, jQuery and HTML 5. It skillfully combines the best traits of a platform for small/middle-sized online retailers and requires minimum time to set up and start selling. LiteCart possesses a logical and easy to navigate interface, one page checkout, advanced SEO and other advantageous features. Moreover, it can easily be installed on your desktop using AMPPS which makes LiteCart even more flexible and convenient. Henceforward, Cart2Cart offers a chance to experience the benefits of LiteCart shopping cart by using an automated migration service. Try out how easy it is and perform absolutely free Demo Migration!